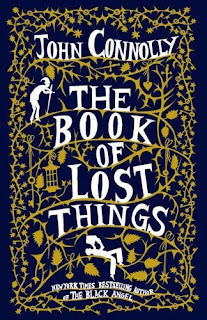 The Book of Lost Things is a fantasy novel by John Connolly. The story is about David, a young boy, struggling to cope with his mother's death. Soon his father remarries, and his family as he knew it falls apart. This is when David begins to hear his books whispering to him, and soon the walls between fantasy and reality begin to blur. "He sat up late into the night, squashed into a corner of the living room while the grown-ups exchanged stories of a mother he had never known, a strange creature with a history entirely separate from his own. (...) And when at last he fell asleep, David dreamed that he was part of these tales, a participant in every stage of his mother’s life. He was no longer a child hearing stories of another time. Instead, he was a witness to them all." Teaser Tuesday is a weekly bookish meme, hosted by MizB of Should Be Reading. Grab your current book, open to a random page and share two teaser sentences! That's a lovely teaser... This book sounds good. I hope you're enjoying it! Wow that's a pretty awesome teaser. OH, I like that one. Thanks! Interesting... I think I too will start participating in Tuesday teaser.. I love this teaser. It's real beautiful! Another one I don't think I've heard of. I hope you're enjoying it. :) My teaser can be found here! Wow! I see what you mean about the writing....fabulous! Great teaser...what had happened between that man and his mother? Hey Priya, that is a great teaser. Sounds like a book I'd enjoy. Harish - I think you've said that some time before too, and you should!! ooo, it sounds great! Nice writing style, from the sound of the teaser. Vishy - Thanks for stopping by :) I hadn't read anything by John Connolly before; but I'm enjoying this, and I'll definitely read this book you've recommended after I finish this one! Deepali - Thanks for stopping by :) It really is great! Excellent teaser! I've started this one a couple of times, but haven't managed to finish it yet. But I'll be giving it another try soon. It sounds so much like something I'll love.